One of the biggest problems of most bloggers is how to get free dofollow backlinks from dofollow high PageRank websites. The simple reason is that backlinks still remains one of the top ranking factors according to Google. That’s why most bloggers do crazy things today to get these backlinks. However, one of the simplest ways is to drop reasonable comments on dofollow commentluv enabled blogs in your niche. I know, with a little bit of effort, you can still get on Google page even without a single backlink to your article. I have written on 4 ways to rank on Google page #1 without backlinks. I recommend you check that post out. 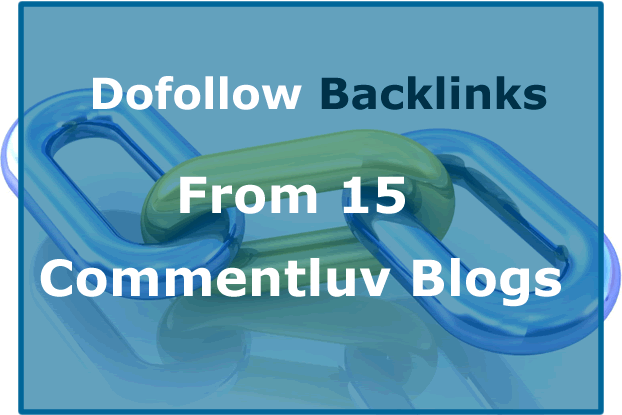 In part 1, I shared 5 commentluv dofollow enabled blogs for you to drop comments and get some awesome dofollow backlinks to your articles. In this part 2, I will be adding 9 more blogs to the list. That will be a total of 15 so I encourage you check all the blogs on the list. If you are comfortable with them, take your time to read articles and drop reasonable comments. Commenting for backlinks is the wrong motivation. That’s because if you have this at the back of your mind, it influences your posture during the activity and that will adversely affect the quality of your comment. Most people who comment for backlinks do all the odds just to get their comments through. However, a lot of backlink-hungry comments end up in the waste basket. The reason ethical bloggers drop comments on other blogs is to create relationships. That’s because relationships generate editorial backlinks, traffic and income. If you position yourself to connect with other bloggers through blog commenting, you do it rightly. So I encourage you drop comments on these blogs to create a relationship. The backlink reward will be secondary. Of course you are going to get traffic once your comments start attractive eyeballs. How do you comment for relationships? One of the frequently asked questions I get from many starters is how do I know a link is dofollow or nofollow? Well, it doesn’t require you buy any complex software. You are not even going to spend a cent on that. All you need is install a plugin in your browser. I use Google Chrome at the moment and this extension is what I use to make the difference between dofollow and nofollow links. In the images below, you’d notice that nofollow links are surrounded by red dots. Dofollow links don’t have anything around them. Igert le Roux is the brain behind this blog. It’s quite simple at the moment but I love the quality of articles I have read published by Igert. Internet Marketing is a business, a career, not a game. If you want more about this, check out what Igert shares on her blog! Peter is the “remote Thai village marketer who cares”. He is 70+ years of age but still loving every bit of his online businesses. For sure age is not a barrier to online success. Check out Peter’s blog and be sure to grab his free gift on 25 Hot Ways To Get FREE TARGETED TRAFFIC. This blog is powered by Lisa Jahred who helps his readers create a profit-generating website that gets traffic and conversions. If you are interested in blogging tips, webmaster resources, web design, graphic design, social media, search engine optimization, social networking, and related topics, I recommending checking out Nile Flores’ blog here. NB: These blogs are commentluv dofollow enabled today. They can change any time without notice. It’s up to them so I don’t give you any guarantee that by the time you visit them, they will still be dofollow commentluv blogs. As I mentioned above, your first attraction should be to connect with the bloggers behind them. You should not primarily worry about how to get free dofollow backlinks from their blogs. Once you create relationship, the backlinks will follow. So let me know what you think in the comment box. If your own blog is commentluv dofollow enabled, let me know so I can feature it in the next post in the series. Thank you for adding 9 more blog lists for dofollow backlinks, add some more in coming days. Waiting. This blog list is such a treasure for bloggers. We get able to make relations by commenting as well as getting two backlinks, and one important thing is the Traffic we receive by commenting on these popular blogs. I know you have to do hard work to find them. Appreciate your job. It’s different from other bogus dofollow comment blogs list as you are known for original work. I always do my research because I recommend something. Truth is we can make mistakes sometimes but we do our best to come up with something worth it. These blogs on this list are blogs I engage with and I do this to promote them as well. do check them out too. Thanks for the inclusion, Enstine. What an informative post, I know most of these bloggers’ pages and I am a regular visitor and a comment author to their pages too! I swear that I am not going to stop posting comments on my friends pages due to the above mentioned experiences, Hope some readers who read this can suggest some solution to this Problem! One said you need to have a pic in Gravatar Yes, i have this ! That is not the problems! Any suggestion anybody here to fix this! It looks like something is been happening with Askimet because that’s what most of us use. I get some really good comments pushed to spam but I check my spam folder each time before emptying. I have recovered all your comments sent to spam and about commentluv issue, I really don’t understand why it happens to you. It could be an issue from your end given that it does happen on several other blogs. Maybe if you talk to Andy about it, he may have a suggestion. thanks for keeping the luv despite the technical deterrent. This is a really great post. I appreciate you and i really enjoyed this post when i read it. Great points you gave.Thanks for sharing this post with us. Blog commenting is without doubt is a great source of building new relations, meeting like minded people and building some very good backinks for our blogs. As you said Blog commening also drive direct traffic as well. So, any blogger who is seriou about his blogging journey can’t afford overlooking these endless benefits of commenting niche related blogs. I have already read the part one also tried to leave comments on those blogs, today you gave us some more wonderful blogs, this will help a lot in the long run. So good to see you here and thanks for taking the time to drop a comment. hey thanks for the mention Enstine. When people are focused on the wrong thing (i.e., backlinks) their behaviour changes, no doubt about it. They’ll tend to do the minimum necessary to make a comment, and then move onto the next blog. On the other hand, when they’re focusing on adding value to the discussion, they’re comment will reflect their changed disposition. The backlinks naturally become a side benefit, not the main event. Thanks for coming back as promised Kim and for stressing on a solid point. Great article! I also use Commentluv and I have dofollow links on my website. I will spam comments that are beyond general or so obviously spammy. I will check out these sites as I am always looking to networking with other bloggers. Thanks for sharing! Thanks for the recent visit to my Blog. And I am really amazed about your knowledge with commenting. I know there are thousands of comment Luv blogs, but there are very few where we can get dofollow backlinks. But as you have mentioned in your post that we must do commenting for making the relationship with bloggers, I think that is the best way and I have done comments so many times for the same. For now thanks for sharing this amazing post. If we comment for relationships sake, we will finally get the backlinks. It’s that simple. BTW, how is your week going? Thanks so much for featuring my blog along with the other great bloggers here! Have a great rest of the week, Enstine. It was a pleasure Sue and I’m sure many of my readers will find your blog a great addition to the list. This is why i always visit this blog, there is always something new and helpful. Thanks estine for sharing this dofollow backlink sources and please do add more soon. Hope you are fine, and you have done a fantastic job once again by collecting the awesome blogs that give dofollow in blog commenting. As you said, I do commenting and sharing the blog posts of other bloggers to create a good relationship but never to create backlinks. Also, I would like to leave the meaningful comments after reading the blog posts and never write my thoughts without going into the content. I think that I’ve checked your part 1 blog commenting post and now in this second part. Backlinks still matter a lot and thus the bloggers are keen interested in building links through blog commenting. It is good, but leaving the views without reading the posts just for the sake of backlinks would not be okay. Thanks for the great list of blogs that offer dofollow through blog commenting, you always inspire us to blog with passion. Nirmala recently posted…How To Enable/Disable Popup Blocker On Every Browser? I’m good and thanks for stopping by today to share your point on this post. You are right about the importance of backlinks in ranking today. That’s why any posts that dwells beautifully on the subject gets a lot of attention. Not only are backlinks still very important, they are also almost hard to get. A lot has been said about getting them through commenting and guest posting. But it’s still not easy especially for newbies who can access to guest post on some top PR blogs. I’m still compiling another list – PART 3 and I hope to still get you around to share your experience again. I saw your comment to Kim on Facebook that you were writing a post to include the one he just wrote so wanted to stop by and see what you were sharing. A followup to last year’s post, bravo for adding more to the list here too and educating people as to why they should be comment and the REAL benefits to this hidden gem. So I had shared my thoughts on the post last year and nothing has changed. Commenting is still the most powerful way to get in front of your target audience and start making connections. Just think of it as an added bonus to the backlinks and traffic that you’ll get from having done this. Think smart, think long term and it will benefit you greatly. Great share and I see you used a few of my comments as examples, thanks! Yes I think it will remain an exciting activity with a bundle of rewards for as long as blogs exist. I love how it connects bloggers. I love the engagement and conversation going on. People have moved from virtual engagement to actually meeting and having nice moments offline, thanks to commenting. I enjoy building relationships with other bloggers through commenting. It really is the cherry on top when you get a do follow backlink with your comment. Thank you for sharing this list of blogs. I’ll have to check them out! Blog commenting is not just a way to build links, it is also a great way to build relationships with some like minded people. I am a regular reader of most of the blogs you have shared in your post. Thanks for the awesome share. First ever visit to your blog. Came to know about it from a share at fb. A genuine way you shared to get dofollow backlinks, boss! Thanks for coming here for your first time and taking the time to drop a comment. All these websites are excellent websites to comment on. I connect with most of these bloggers myself. I truly believe in the power of blog commenting, I wrote a pretty detailed post about it. For me, the relationships are the most important part. The backlinks are secundary for me, but it’s definitely a nice advantage! If I see someone is coming on my blog without adding value, I often do not approve them. However, if someone adds to the conversation, I’ll gladly give them a dofollow link for doing so! Blog commenting is an evergreen activity and the results will always keep coming. It was a pleasure adding your post to this list buddy. There are better days ahead so let’s keep giving. I can honestly say, when I comment on someone’s post, the only thing on my mind is trying to add value to the topic, if I can. I’m not in it for the backlink, that’s just a an added plus. The relationship building aspect is just also important, because we can’t do this alone. By engaging with others, we can share ideas and learn things we may have not known. I’ve met so many new people just from my commenting on their blogs and vice versa. I’ll be sure to check out these others you have mentioned here and also in you first post pertaining to this topic. Thanks for dropping a comment and for the backlink from yoour blog. It was good adding it to this list and I’m sure some of my readers will come check it out. Meanwhile, let’s keep the networking of blog commenting alive. That’s what makes the activity exciting. Enstine Muki recently posted…Exactly How I made My first $500+ Online with ZERO skills! For what it is worth, I allow dofollow comments on my blog as well. The more I think about it, the more I think it is a great way to connect to my readers. All these websites are excellent websites to comment on. Helpful post here. This one of the nice informative post I truly believe in the power of blog commenting. I just love the examples you have given here. I do know most of these wonderful people and follow them myself. Having CommentLuv Premium is a treasure. One can choose which blog to pick that coordinates with the blog post one is reading. But most of all, when it comes to comments, it is my favorite way to engage with others. If we leave a comment that acknowledges we read the post, and tell the author what we liked about it first, then we can elaborate too. If one is a blogger, commenting is a must! Plus, people do read comments and I myself have found many new people just from a comment they have left on a blog that I resonated with. Go over to their blog and there ya go! I don’t know what I would do without CommentLuv! Commentluv is awesome and it’s been on my blog from the very first day I ever setup my first blog. It makes a lot of sense to use it. Commenting is what makes blogging awesome especially if you do it to connect with others. I have met and connected with a lot of bloggers as well, just by going through comments on other blogs and checking them out. “You’re never leaving this blog” that was the first thing I said to myself when I first landed on Enstine’s blog through a comment he made on a blog. You’re the man Enstine and I will make sure yo read and drop comment on each of these blogs you mentioned above. Encouraging comment bro. I’m really moved and thanks for taking such a decision and sticking to it. thanks for the list. If above blog change dofollow to nofollow then already commented links will also change to nofollow or it will remain as dofollow. Yeah relationship first then the link will be added. Wow. This is a great way to address the subject of backlinking. You certainly know the art of teaching online marketing principles. The fact that you link to other blogs on this page is a valuable tool in that process. I have already had quite a few visits to and comments on my site as a result. Visiting other blogs is a great way for new bloggers to learn and find their feet. It’s awesome to have you here and thanks for the exciting comment. Hi Enstine, great list of site and great advice, I have to say that I had a massive influx of spam comments when I had commentluv installed, although I do love the plugin, I do use it on some other sites that I admin. What an excitement to have you here. You know we’ve gone a long way so your presence here makes me feel really happy. How are you doing and how is the movie niche? Great informative posts with a good list of commentluv enabled dofollow blogs. I have been searching for a good list of commentluv enabled blogs but those I found, the blogs are no longer dofollow blogs. No doubt blog commenting on commentluv blogs is the perfect and easy way to get quality dofollow backlinks. I have seen ranking boost for most of my blogposts that I have promoted via this technique. It is the easiest way to get ranking for low competative key phrases. Great to have you here and thanks for the addition. What do you think wll happen if Google drops the value attached to comment links? That is why we don’t need to rely on a single source. We have to diverse our backlink profile. Great article, This post has totally blown me away. What an incredibly generous share of your time and knowledge – thank you. I’m certainly going to be putting your tips to use for my shiny new SEO blog Zoved. Faheem, thank you a bunch for this comment and encouragement. Thanks for sharing this list of dofollow blogs. I read and comment on 3 of these blogs, but the rest I’ll have to check out. Commenting is one of the easiest ways to get backlinks and it has helped me get over the hump quite a few times in my blogging career. These sites will definitely help those get traffic back to their blogs. Good to see you here and thanks for this wonderful comment. I just loved reading about these commentLuv enabled blogs and it needs to be shared by me as I am going to do it right now. The best thing which I really like about this article is, you covered at least every high pagerank dofollow commentLuv blogs which makes it more helpful for me than others. But you need to short it out because of some from these are actually no followed. This post you published had made my day, I have been placing meaningful comments on those blog links all day, I did not remember to have my lunch, I was just busy commenting and it became a fun thing to do Sir. Please I hope you going publish more interesting and vital articles like this soon…. lol thanks for the comment. I hope you did take some break because you need it. Sometimes I work for hours without stepping away from computer. But we do really need the breaks. Did you check my article for today about the $500+ story? I got it, i really wanna take my time to understand the article on the information its trying or wanna pass to me. I also enjoyed replying all my comments i left on the blogs you listed….It was fun doing all that in 45mintus…..
to our blog or website. Siegfried Silverman recently posted…CAN WE LEARN FROM CHANGE-OVER TECHNIQUES? You know those who comment for links primarily always fail. This is a great way to address the subject of backlinking. You certainly know the art of teaching online marketing principles. Thanks for sharing this list of do follow blogs. I read and comment on 3 of these blogs, but the rest I’ll have to check out. Commenting is one of the easiest ways to get backlinks and it has helped me get over the hump quite a few times in my blogging career. These sites will definitely help those get traffic back to their blogs. Thanks for taking your time to compile such a list of dofollow comment enabled blog. Apart from having the dofollow comment system, I also appreciate the fact that the blogs listed are filled with informative contents. I already commented on 5 blogs and will keep commenting after checking out others. What an excellent list Enstine. Thank you. I recently upgraded to CommentLuv premium and have activated do follow on my blog for those who’ve left more than 3 comments. I’m doing it to reward regular visitors rather than for getting masses of extra comments. Thanks for the list, with CommentLuv as well as giving reward from the owner of the site so that we can get a DoFollow backlink. I really liked the comment facility like this, I also get a DoFollow backlink from your site as well. Thanks for sharing this useful list. But I want to know that some of the blogs that you mentioned having high Alexa rank so, so this will affect our ranking? Recently, I changed my commenting system to CommentLuv. I also changed a plugin to Akismet. Apparently, the Anti-Spam plugin I was using, combined with the WordPress commenting system was making it really difficult… if not impossible… for people to comment on my blog! Although I am using the free version of CommentLuv, I have been told that commenting is much easier now! I think you did well to carry out these changes. You should see some changes at the level of engagement through commenting. Yes, commentluv does attract comments. Be ready for those link-hungry commentators too. They will skim through and try to drop one or two lines to get that link benefit. There is another way to find whether the link is do follow or no follow, you just need to give a right click on the link then you will find inspect element option, just click on it and see if it is showing rel=”no follow” it means link is no follow if it is showing rel=”do follow it means link is do follow. Yes, this method is also very helpful but I think it is a little bit difficult for those who do not have the knowledge about HTML or who can not find the link in the inspect element box so, for those plugins are good. But to find the link you can type the Ctrl+F and then type the link text. Thanks for the list..Hope you will continue the list. I read it some where that No follow links also good for websites…Is that right?? This is an awesome list and I can’t wait to try these sites. Eagerly waiting for few more sites and few more tips, Thanks for sharing this list. What´s the link of long tail pro? I would like see how it is..
Oh Man, you’re really amazing. You’ve simplified the jobs of many new bloggers by providing an amazing list. Nowadays its tough to get dofollow links! Thanks to you for the sequel to the first part!Commentluv is definitely lovable. I agree, there is no need to spam sites to get backlinks, as these comments will just be deleted anyway. I have a site that has been hit by spam comments, up to 20 per day, and it is very annoying having to go in and delete all of the comments. I have installed CommentLuv on this site and this is great for stopping spam. I have had no spam comments on the site since installing it. I see that you are using CommentLuv, do you find that it helps with the combat of spam comments? Lots of great tips I figured out over time. The number one thing that has brought me the most readers that actually read (and not skim) over time is commenting on related blogs with quality comments. Even old articles bring them in. Social media helps support people who want to get notice by Twitter or whatever but has drawn fewer new readers than comments. Had not thought about the obvious full name though. Have just used my first name to be “friendly” ? Thanks. Friends, coworkers, colleagues, supporters, grateful recipients of your help or sponsorship, reviewers of your product, and business suppliers are also a potential source for do-follow backlinks. But the best (and most) do-follow links come unexpectedly, linking to your great content. will this dofollow commenting will help to get good link juice for our posts ? and also generally how much it take to get a link juice if we post a fresh one. I have a quick question for you, Enstine, or anyone else who may know the answer. I have left comments, made posts, and published content to many websites that supposedly were giving dofollow links, and after waiting more than a month, I have only had 1 show up in my backlinks domain list. Is this common? Maybe I am not being patient enough. Comments? Ideas? Were there on sites that haven’t had any issues with SEO? I have been searching for the best and easily method of building quality backlinks to my blog. Some lists and tutorials I found so far was not convincing or maybe I do not understand the writer’s explanation clearly. I am very grateful that I found well detailed information on this blog. Thanks for sharing this wonderful tip here, I found it very useful. Thanks for sharing this wonderful list of do follow blogs. But will this dofollow commenting will help to get good link juice for my pages? I too have enabled Dofollow CommentLuv plugin on my website and according to me this is the best plugin to get good quality comments. Thanks for this post! Nice piece of well crafted content <3 The blogs you covered are really awesome ?? everything you wrote was agreeable really cool thanks for writing such a cool post for us. Hemantkumar recently posted…10 Awesome Lossless Image Compression Tools You Must Try Once. Hey Enstine. Thanks for this post. It’s important, I agree with you, to always view blog commenting as a way to expand and improve your knowledge of a niche topic and to build relationships with the people you’re connecting with. If you comment on a lot of an individual’s blog posts on a niche related website, there’s a higher chance you’ll get a guest post opportunity too. Or they may share your content. Maybe you’ll even get a contextual backlink in one of their existing or future blog posts! It’s not link building, it’s relationship building 😉 Thanks for another excellent post Enstine! – Carl. I have a question for you.I have made over 100 comments on high page & domain authority blogs but Alexa is not showing the backlinks, please tell me why? I am actually looking for valid commentLUV blogs to comment but so many articles which are populating in Google search results are not actually commentLuv blogs, I am really impressed to see all the blog you mentioned here are high domain authority blogs with do follow comment Luv blogs. Thanks for sharing such a valuable resources, see you soon with another article. I was searching for blogs that have comment luv. This is how I found your blog and I am happy I did. I had this plugin on my blog too, but I removed it because I noticed that I was getting a lot of spam comments. Comments with comment luv look so much prettier than with Disqus. Thanks for sharing your favorite blogs with do follow comments! Thank you so much for sharing it in deatil. Hey Enstine Muki, This is a great collection of comment luv blog buddy. I love read your article and I’m a regular reader of your blog. Great work Buddy. Thanks for sharing such great content with us. Some nice set of blogs shared in this post that makes this post different from other crappy posts on commentluv enabled blogs list. Will try comment on some of these blogs. Firstly, thamks to share this list of 15 dofollow blogs list, your work is really appreciable. Keep it up! To be frank, I am really tied of making backlinks for my niche sites. Is there any way to make this backlinking process easier without much pain ? This was a worthwhile read, thanks for the time and effort you put into pulling all resource into one hub. I have been rejuvenated. Cheers! How to get dofollow backlinks for Google Page #1 easily! Sir thanks a lot for this post . It cleared my concept about how to create dofollow backlinks. Since I have started my carrier in blogging i have always created only No follow backlink. But today i learnt a lot. I pray to God you will always lead in success. Wasim recently Posted this ..